https://youtu.be/OTrvZmwa63w, Best choice for boys and girls. Model:R2.Smart Robot Toys,Best gift for boys and girls.playful robot,fits for fun family time;Kid's companion,keeps kids engaged and entertained and offers a fun and educational way to play. Flexible multi-joint in shoulders,elbows and thumbs and high-quality bottom skating wheels to carry out a various combination of moves and enhance the flexibility of the robot's moves. 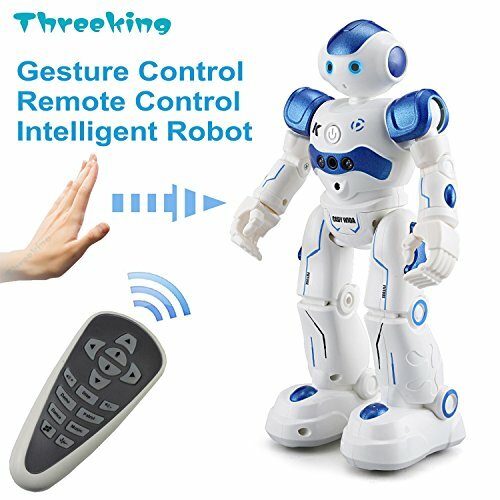 ★The exclusive seller of the robot is"THREE KING TECH",Other seller is fraud,Please check the brand"Threeking",like the last picture,If get the robot without the brand,please complaint to Amazon directly,and get back your property. If you have any questions about this product by Threeking, contact us by completing and submitting the form below. If you are looking for a specif part number, please include it with your message.